Season 5 of RuPaul's Drag Race was perhaps its strongest, the cast including fan favourites with big personalities like Alaska, Detox, Alyssa Edwards and more. Yet it was Jinkx Monsoon who came out on top: the shy and endearingly awkward queen with a taste for Broadway and old fashioned comedy. That perhaps explains why she's arguably less visible than other alumni from the show. You won't see her performing polished lip-syncs on YouTube, or offering glamorous looks on Instagram. This ol' fashioned gal doesn't need technology: just give her a stage, a mic and a pianist. She's in her element in Jinkx Sings Everything, her touring improv show. The set-up relies on her wit and talent, but also her encyclopaedic knowledge of musical theatre: it's up to the audience to shout out song suggestions and Jinkx duly performs. Between she offers amusing anecdotes, throws shade at other Drag Race contestants, and pokes fun at the audience. It's simple yet brave and always hilarious. Vocally, Jinkx favours power above all. She's certainly got pipes, which comes in handy when you're belting show tunes, but she's sometimes a little over eager, the voice straining on those top notes. Then again, this is an audience inclusive show that celebrates musical theatre rather than offering Broadway standard singing - each song, no matter how dramatic, feels wonderfully frivolous and tongue-in-cheek. And she can still surprise, be it with her classical voice singing "Greenfinch and Linnet Bird' from Sweeney Todd, an overtly dramatic rendition of "Rose's Turn" from Gypsy, or an outstanding Judy Garland impression. As a character, Jinkx is a walking homage to Broadway divas. It's her intelligence as an entertainer that's most impressive though. The way she can read a room to gauge her jokes that are always smart, sometimes political, and don't rely on the silly catchphrases or bawdy grotesque humour of her fellow queens. I may be biased being English, but her grounding in British humour is particularly welcome. Jinkx Sings Everything is a show that relies, above all, on her personality. 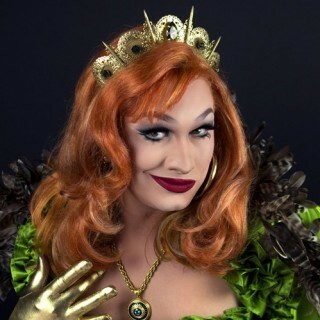 Jinkx is an utterly charming queen with an absolutely filthy laugh, a born entertainer. She may balk at being asked to sing "Defying Gravity", but it's a song that's well suited to her: to all her detractors, in this show she's every bit a winner.